As the Duke Ellington School of the Arts turns 40, George Washington Today examines its early days as a campus arts program. 2014 represents a landmark year for the Duke Ellington School of the Arts: the renowned arts school is celebrating its 40th anniversary this year and recently embarked on a renovation of its historic campus, with completion scheduled for 2016. As a child with a passion for music, Ronald Lee Newman spent a lot of time at the Duke Ellington School of the Arts. So when he enrolled as a student, the first day was less about navigating the hallways of Ellington’s Georgetown building and more about realizing the opportunity in front of him. Ellington is celebrating its 40th anniversary this year, honoring its namesake and arts heritage with events throughout the spring and summer. The renowned arts school also recently embarked on a renovation of its historic campus, with completion scheduled for 2016. “It’s been a tremendous year and a very busy year,” said Charles Barber, president of the school’s board of directors and deputy general counsel at the George Washington University. Mr. Barber is one of three GW administrators currently serving on the Ellington Board—Department of Sociology Chair Gregory Squires and Columbian College of Arts and Sciences Executive Associate Dean Roy Guenther are the others. The GW connection is both symbolic and tangible, part of a longstanding partnership between the institutions that dates to the late 1960s. Long before it became one of the top arts schools in the country, the Duke Ellington School of the Arts was a summer workshop created and nurtured by a GW student. 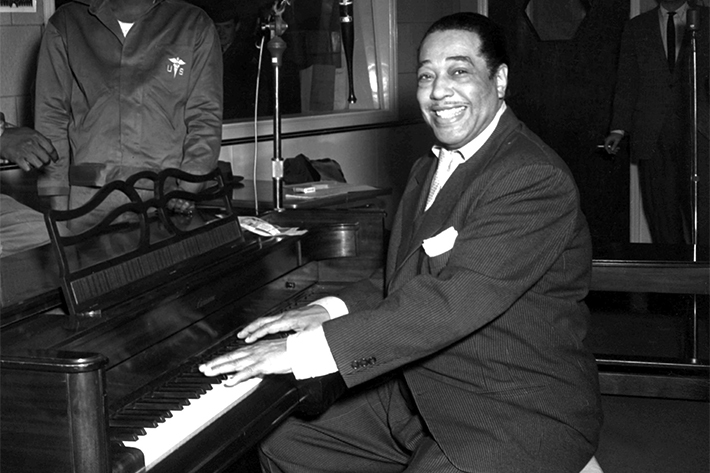 Edward Kennedy "Duke" Ellington was born in Washington, D.C., in 1899 and retained a strong connection to his hometown throughout his life. He led his orchestra, named "The Washingtonians," from 1923 until his death in 1974. Like most origin stories, this one occurred in stages. At the height of the civil rights movement, a group of George Washington University students formed the Black Peoples Union—later the Black Student Union—and held an inaugural black cultural festival on campus. The chair of that festival, a passionate senior about to begin her first year of law school named Peggy Cooper Cafritz (then Peggy Cooper), wanted the program to serve as a showcase for black culture from all over the city, not just at GW. “The city had the riches and great talent,” she said. Ms. Cafritz had come to GW from Mobile, Ala., in the summer of 1964. She was active in the community and knew how to organize. Within weeks of arriving at GW she was pushing against established obstacles, beginning with a fight against racial discrimination by fraternities and sororities—a fight she ultimately would win. The 1968 Black Arts and Entertainment Festival brought in young musicians and performers from all over the city. Toward the end of the evening, Ms. Cafritz and Mike Malone, a choreographer who was working on a master’s degree at Georgetown University, were discussing the event. It was a shame, Ms. Cafritz said, because the kids had talent, but lacked polish. “Mike said, ‘Well, why don’t you start a school?’” Ms. Cafritz, B.A. ’68, J.D. ’71, recalled in May at GW’s Women and Philanthropy Forum. Workers remove paintings from the Duke Ellington School of the Arts last week in preparation for a two-year renovation that will add around 100,000 square feet of space. The old Western High School building, which dates to 1895, has been the home of the Ellington School since 1974. Inspired by the idea, Ms. Cafritz sat down that evening and wrote a three-page proposal for an arts school. She phoned her father. He told her to rewrite it. She rewrote the proposal, this one for a summer program at GW, and took it to then-President Lloyd Elliott. He said he would support it and provided Ms. Cafritz with campus space and an office. He also told her she was in charge of raising money for the program. “I was like, ‘Are you crazy?’” Ms. Cafritz said. Eventually, the funding—including $30,000 from university benefactor Henry Strong—came in, and the Summer Workshop for Careers in the Arts was born, providing training for dozens of students and operating as a sponsored research program that could raise money under the name of the university. 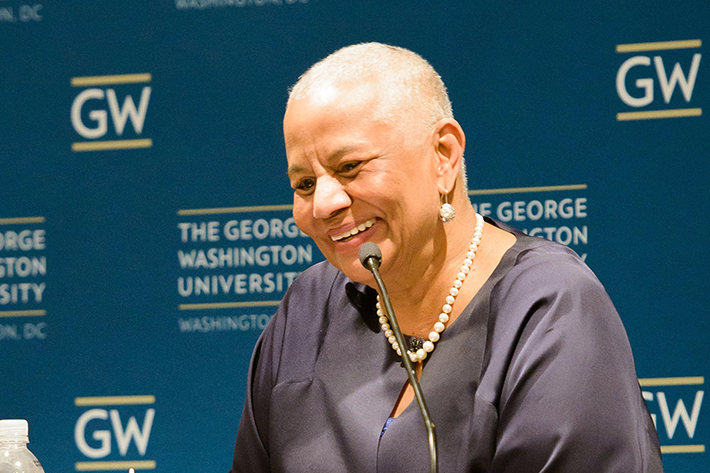 Peggy Cooper Cafritz, speaking at GW's Women and Philanthropy Conference in May, reflected on the benefits of running the summer arts workshop through the university. "We became a program under 'sponsored research,'" she said. "So when I tried to get funding it wasn’t as a crazy college student, it was as somebody coming from GW. That was enormously helpful." The program wasn’t just about the performing arts. It was about economic and social integration. Mr. Malone and Ms. Cafritz wanted the arts to provide opportunity where it didn’t exist; they wanted to add polish to talent. That’s an ethos that guides Ellington today. The school attracts students from both inside and outside the city and from a range of socioeconomic backgrounds. Twenty years after graduating, Mr. Newman, now the school’s director of operations and the president of its alumni association, said enrolling at Ellington likely saved his life. As the Summer Workshop for Careers in the Arts grew in popularity in the early 1970s—expanding into a released-time program where schools throughout the District would send their kids for accredited coursework—it also outgrew its space, bouncing from GW classrooms to church basements and eventually winding up in a warehouse on upper Georgia Avenue. 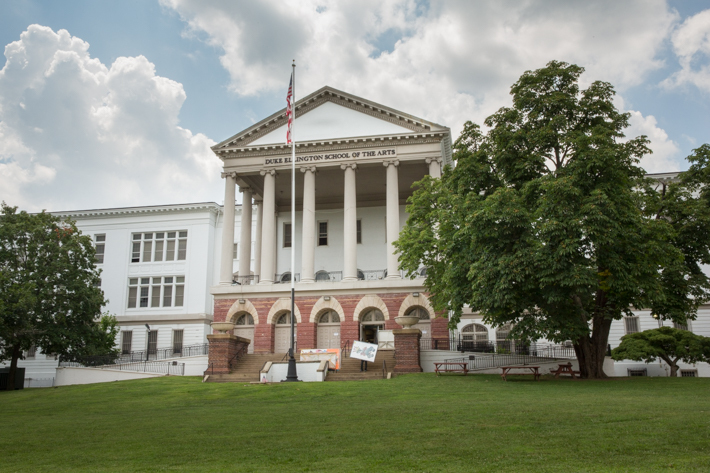 In 1974, after years of lobbying, Ms. Cafritz secured permission to turn the arts program into an arts school and found a building on R Street in Georgetown—the former site of Western High School. 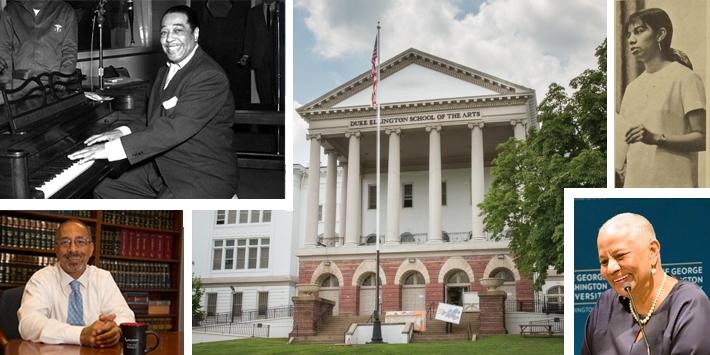 When Duke Ellington died in May 1974, the school was named in his honor. 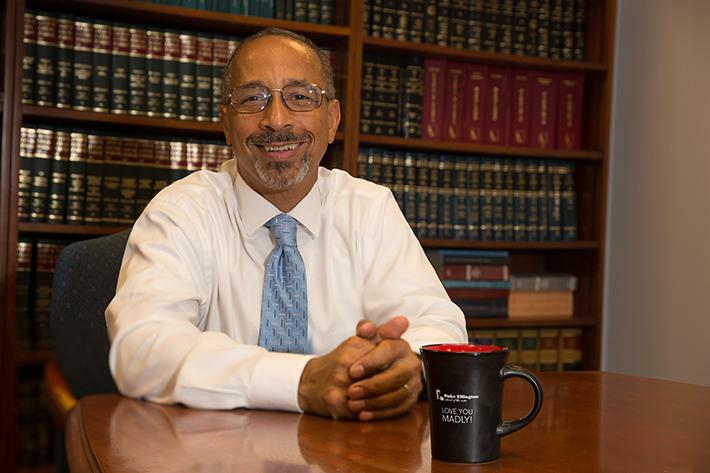 Charles Barber, president of the Duke Ellington School of the Arts Board of Directors and deputy general counsel at the George Washington University, knew the school was competitive before he joined the board in 2005. "I knew it was popular; I didn’t know it was as popular as it was," he said. "It attracts students from all over the city and from outside the city. And usually it’s the other way—students leave the city to go attend better schools in Maryland and Virginia." Four decades later, Ellington stands at the doorstep of another new era in its history. Mike Malone, a celebrated tour-de-force in Washington’s theater community for 40 years, died in 2006 at age 63. Peggy Cooper Cafritz, an Emmy and Peabody Award-winning documentarian and a former president of the District of Columbia Board of Education, now serves on the boards of the school she created, as an at-large member of the Ellington School Board and the Ellington Fund (the school’s fundraising arm). On Aug. 1, longtime administrator John Payne will succeed Rory Pullens as head of school. Ellington, currently operating out of two buildings in Northwest D.C. during campus renovations, is at a pivot point, with eyes on both its heritage and the future. 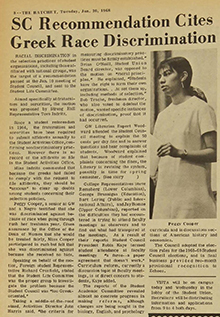 Days into her freshman year at GW, Peggy Cooper was leading the fight on campus against racial discrimination by sororities. Within four years, she would begin building the Summer Workshop for Careers in the Arts. Preservation will complement functional improvements. The renovation, Mr. Payne said, is expected to add around 100,000 square feet to the building, a lot of it performance and exhibition space. The current building, which dates to 1895, was never intended to house a performing arts school, though Ellington officials and board members have worked with construction firms on pro bono projects in the past, including constructing a recording studio and renovating the dance floor. Ellington has found creative ways to flourish. In 2000, the school reached an agreement with the city that allowed it to remain in the public school system while also creating a governing board and formal partnerships with GW and the John F. Kennedy Center for the Performing Arts. Through the GW connection, Ellington has developed one of the only museum education programs at the high school level in the country, Mr. Barber said, under the direction of Marta Reid Stewart, M.A.T. ’87, a graduate of GW’s museum education program. Ellington’s graduation and college acceptance rates, long strengths of the school, are at 99 and 98 percent, respectively. “Ultimately, everything we say and do has to be about the achievement of young people,” Mr. Payne said. “This moment in our history is about celebrating the fulfillment of the program that Peggy and Mike built—making it what it always was supposed to be. Alumna and Duke Ellington School Co-founder Peggy Cooper Cafritz emphasizes local programs.